Twizel Bridge, built in 1511, two years before the Battle of Flodden, provided the only dry crossing of the River Till between the Tweed and Etal. During the Scottish Campaign of 1513, it is likely that parts of both armies crossed the bridge. The Scots on the way from Coldstream to Norham in late August and the English on the morning of the battle. Accounts indicate that the English Vanguard, including the English artillery, crossed the Till at Twizel on the morning of 9th September 1513, on the way from Barmoor to Branxton. Built in 1511, Twizel Bridge offered the only dry crossing point of the River Till between the south bank of the Tweed and Ford 10 miles to the south. 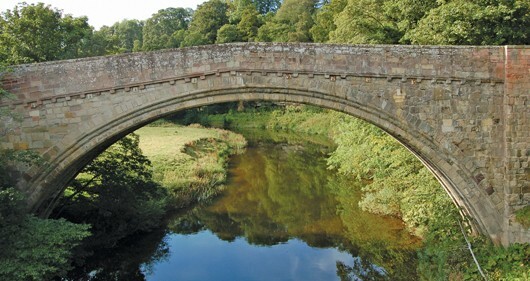 At the time of its construction it was the largest single span bridge anywhere in Britain (90ft from bank to bank) and is typical of early 16th Century (late medieval) single span bridges with a comparatively narrow deck spanning between wider bridge abutments and 5 close-set chamfered ribs under the arch helping to form and support the structure. Unusually however it remained largely unmodified between the time of its construction in 1511 until it was closed to road traffic when the new bridge was opened in 1983. This fine and unspoilt example of medieval bridge building is likely to have seen action at least two times during the Scottish ‘Flodden’ campaign of 1513. The Scottish Army is said to have crossed the Tweed somewhere in the vicinity of Coldstream (between Wark Castle and Lennel) before moving along the south shore of the River Tweed towards Norham. 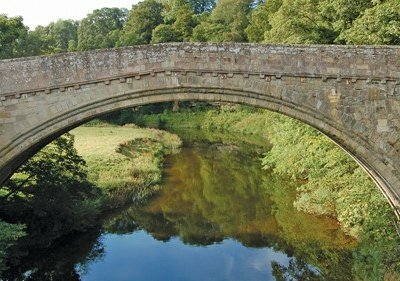 James IV and elements of his army are likely to have used this bridge to cross the River Till before advancing on Norham and turning south towards the castles at Etal and Ford (both also on the east bank of the Till.) James IV is also said to have held his last ‘parliament’ at ‘Twizel Haugh’ which was presumably in the grounds of, or close to, Twizel Castle. Perhaps two weeks later, on the morning of the 9th September 1513, parts of the English Army also used the bridge, this time to cross from East to West on their way from their camp at Barmoor to the battle. The Lord Admiral, Thomas Surrey, is said to have led the English Vanguard (the forward or leading unit) including the English guns in a march via Twizel to outflank the Scottish forces at Branxton. Of course in both the Scots and English cases, it is unlikely that the whole of either force crossed over the bridge, which is too narrow to have supported the speedy transit of thousands of men, beasts and carts. The bridge itself would presumably have been used only by the heavier items of equipment (guns and wagons) along with those important personages who preferred not to ford the deeper waters of the river on either side of the bridge, the route likely to have been taken by the vast majorities of their armies. What is unrecorded is whether the Scottish Army left any garrison to defend Twizel Bridge from a possible use by the English. However, having taken care to seize Wark, Norham, Etal and Ford to secure both his retreat/lines of supply and to protect his flank it is hard to believe that James IV would leave the major strategic crossing point in his flank unguarded. Whether this Scottish force was easily overwhelmed, simply decided to retreat in the face of a superior English force or did not exist remains a mystery. Twizel Bridge is a Listed Grade 1 structure and a scheduled ancient monument. Parking area to the north of the road, at the east end of the modern bridge. Park off the road leaving access to the gate beyond. From Cornhill - follow the A698 east towards Berwick. After Donaldson’s Lodge continue for a further 1 mile, past the entrance to Tillmouth Park Hotel and down into the valley of the River Till. Immediately after crossing the modern bridge over the River Till you will see the car park on your left. From Berwick - follow the A698 west from the A1 for 8 miles. You will pass the Salutation public house and the turning for Norham (Site 7) on your right and eventually will descend into the valley of the Till. The car park is on the right at the bottom of the slope before you cross the modern bridge over the River Till.